This week’s Cash Flow Wealth expert is Patrick Donohoe, President and CEO of Paradigm Life. Pat is here to teach you about how you can use education and money to create a perpetual wealth strategy that allows you to protect your money, get near guaranteed dividends on that money, and have it be tax-free. The first thing you need to do, however, is educate yourself. One of the biggest investments Pat makes every year is in coaches. You need coaches and mentors in your life who have done the things you want to do. Listen in and learn how you can learn more about yoruself, how you can find challenges and problems to create growth, and how you can best set up your money to secure your financial well being. 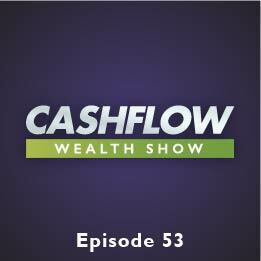 Today’s Cash Flow Wealth expert is Gena Lofton, owner of Passive Income Advisor. Gena’s goal is to help you achieve financial freedome by creating passive income and reducing the taxes you have to pay. There are many factor at play in our society today that are threatening our economy and mean that relying on yourself is probably the only way you’ll be okay in retirement. So focus on collecting assets in order to gain the independence you want and need. Today’s Cash Flow Wealth expert is Jake Larsen, founder of Video Power Marketing. Jake teaches you how to create videos that not only get views, but actually get you leads and sales, getting you Super Bowl results without the Super Bowl prices. Learn about the two different types of video campaigns, and realize that leads that come from YouTube usually lead to higher conversion and bigger sales. Jake teaches the video ad blueprint to turn strangers into loyal fans and paying customers, as well as the video ad formula that captures attention, builds trust and drives targeted traffic. Today’s Cash Flow Expert is Russel Gray, co-host of The Real Estate Guys Radio program. Russel tackles the topic of investing in resort properties, and how you can own entire properties or single rooms in resorts, it’s not just for huge commercial ventures. Russel started his resort investing in Mexico because he knew a guy who knew a guy, which made him feel more comfortable about assembling a good team, which is more important than your property. He’ll show you the 4 step process to resort property investing and how you can pass wealth down to future generations with potentially minimal tax repercussions, as well as how you can even do this incredibly well as a syndication! Today’s Cash Flow Wealth expert is Rich Dad co-founder Kim Kiyosaki, who is determined to help you realize how to achieve your dreams and figure out what your purpose is. Women are constantly expected to be financially dependent in their lives, to defer to the man in regards to financial decisions. It’s important to stop waiting for someone to save you and act for yourself. Listen in as Kim explains ways you can move forward, how to hone in on your true reason for being here, and how Bucky Fuller’s idea of precession can be an enormous aid on your path. Today’s Cash Flow Wealth expert is Mauricio Rauld, Esq, founder and CEO of Premier Law Group. Mauricio explains the 6 steps of syndication and the 3 things you need to worry about when dealing with securities. He gives you inside information into when you need to have your first call with a lawyer, and a step-by-step guide to avoiding slip ups on your road to syndication. Today’s Cash Flow Wealth topic is all about helping you plan your assets for after your death. Learn about the 4 ways real estate pays you, the basics of estate planning, common transfer techniques to consider, how to transfer your portfolio to the next generation and all the answers to common questions. Hear what 4 requirements you want to consider before purchasing investment real estate and the 3 legal concerns when dealing with real estate legacies. Dr Paul Cleveland is this week’s Cash Flow Wealth expert, and he’s here to talk about how our society is coordinated for the people in power to keep the average citizen uninformed. Paul discusses the radical changes the 16th and 17th Amendments to the Constitution brought on to our country and why GDP is a lie (and what they will never tell you about the unemployment rate). The median income in America is stagnant, the debt in America is going nowhere but up for the foreseeable future, and there’s no incentive for the people in power to change it. Your network truly can dictate what your net worth is, so are you spending time with people who are at a place in their life that you want to be in yours? Geoff Woods, Vice President of The ONE Thing and host of The Mentee Podcast, discusses the importance of intentional relationships in your life rather than relationships of circumstance. It’s important to look at your life and figure out 3-5 areas that you need mentors in, then seek relationships with people to help you in that area. Get clarity on what exactly you’re looking for out of your mentors in order to find the one that fits your needs, but remember, you need to always be looking at how you can add value to your mentors as well.